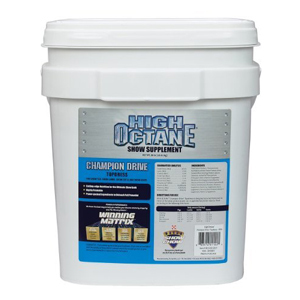 HIGH OCTANE® Champion Drive® Topdress is designed to be fed from start to finish of the show animal project as a supplemental protein source. Feed according to the following directions: Daily amount (lb/day) Pigs Lambs Cattle Goats Pushing 1/2 -1 1/2 -1 1/2 -1 1/2 -1 Holding 1/2 -1 1/4 -1/2 1/2 -1 1/4 -1/2 Toning 1/2 -1 1/4 -1/2 1/2 -1 1/4 -1/2 Non-stressed 1/4 -1/2 1/4 -1/2 3/4 -1 1/4 -1/2 Stressed 1/2 -1 1/2 -1 1 1/2 -2 1/2 -1 *Poultry: 8 ounces per 10 lbs. of feed mixture CONTAINS TASCO®: Research has shown that TASCO® helps lower body temperature during heat stress – keeping animals on feed.